How competitive are you? 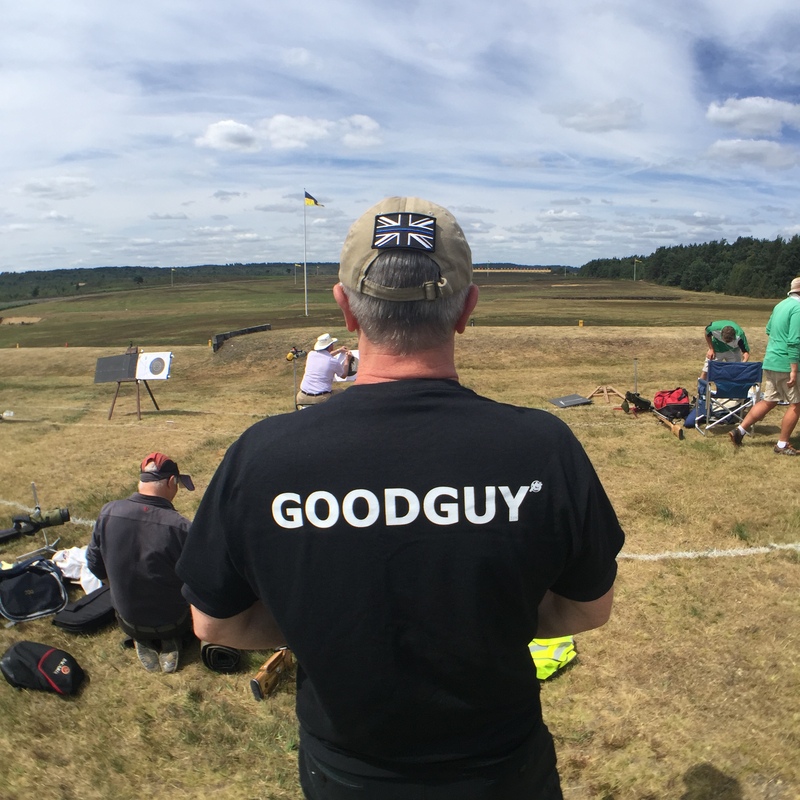 Bisley will find you out…. 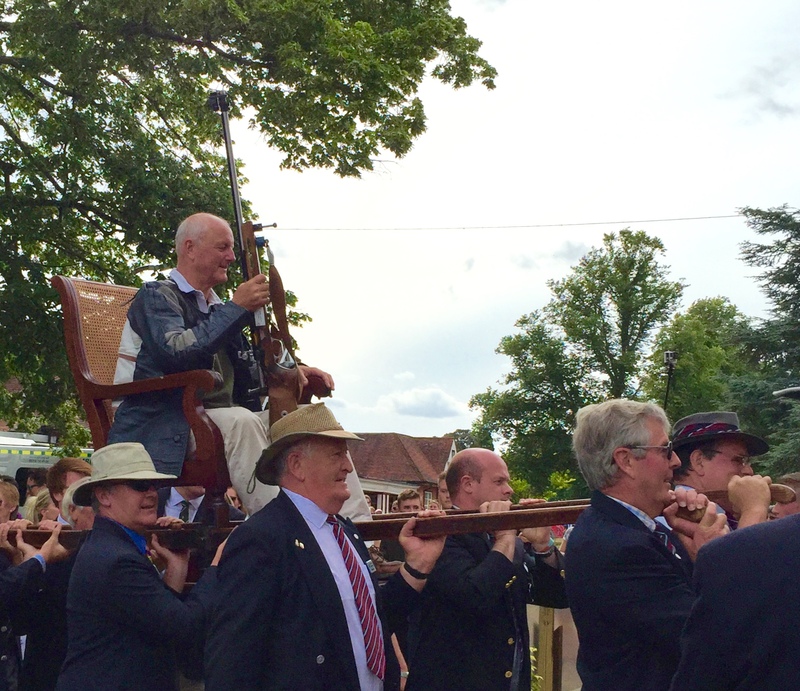 The 146th Imperial Meeting was contested from 18th June to 18th July 2015. It is a shooting competition run over three days and offers a unique opportunity for competitors new and old. 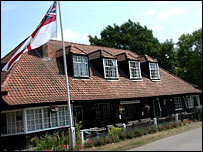 Bisley is the home of the UK’s National Rifle Association. 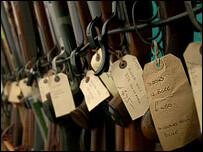 It also hosts other firearms groups and teams such as clay pigeon shooting. It is a very safe, sometimes very noisy haven in Surrey for all things firearms related. Keeping cool on a very hot day! 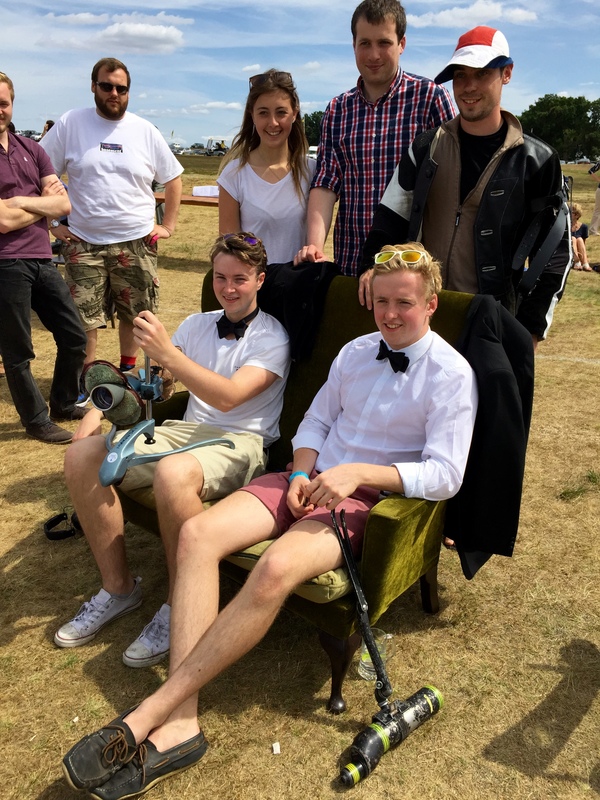 The winner is ‘chaired’ round the camp – not for the fainthearted! 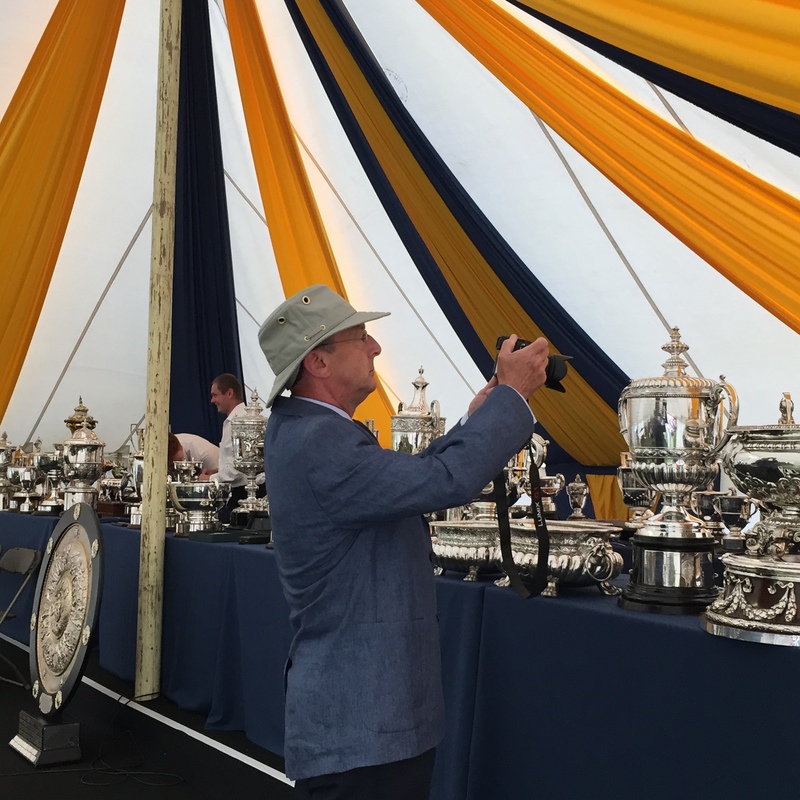 Theres a lot of silverware to compete for. Shooting has long had a difficult image in Britain. But that doesn’t deter the hundreds of men, women and children who, every year, plan to spend their summer holidays on a huge rifle range, complete with chalets and caravans. To set foot in Bisley, home to the National Shooting Centre, is to travel back in time. It resembles a holiday camp, with myriad caravans and tents, children playing, adults sitting in circles on canvas chairs. It could almost be Butlins, but for the constant crackle of gunfire in the background. The nearby Surrey towns are sleepy commuterville. But here, between the neat brick gateposts, there is an altogether different world, where dead-eyed marksmen do battle. 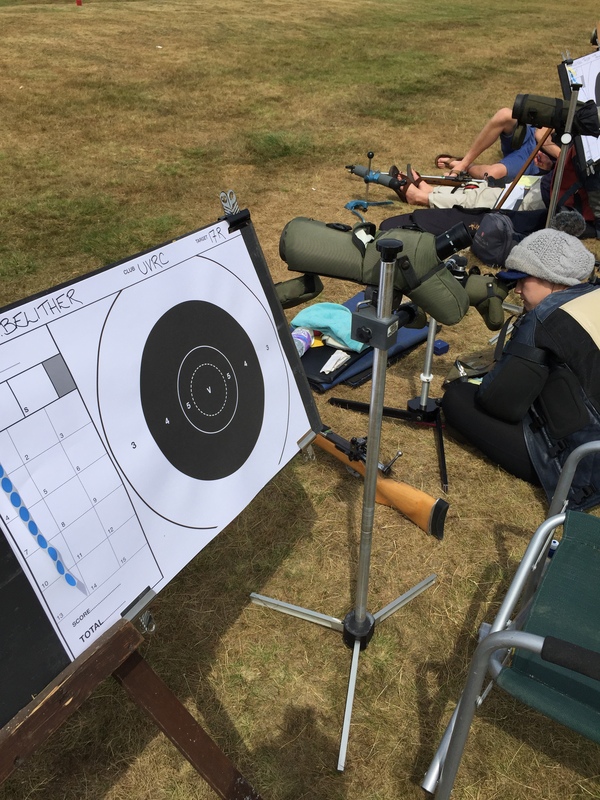 July marks a red-letter event in British rifle target shooting – the Queen’s Prize – which draws 1,300 competitors from across the Commonwealth, who get to try their hand across a selection of rifle ranges. 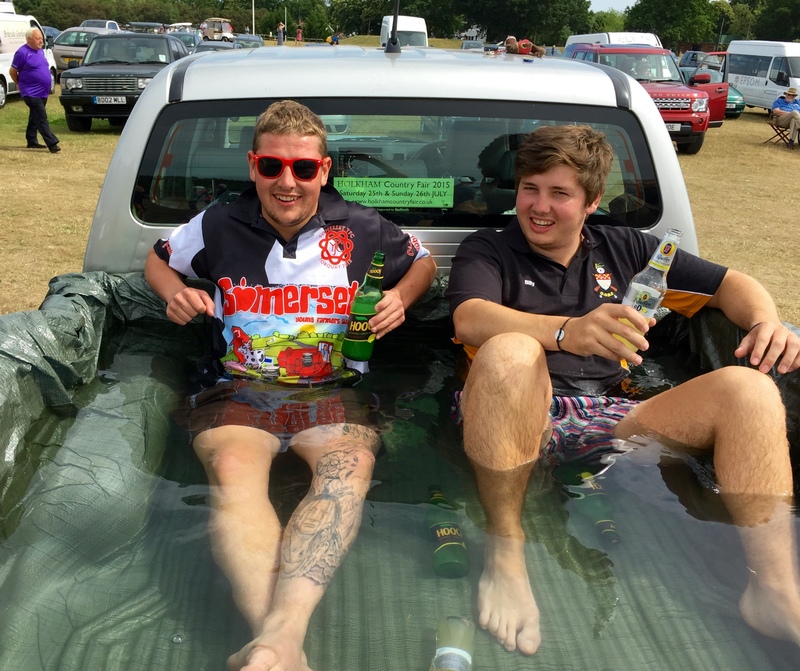 Forget quaffing alcopops in Faliraki or braving the traffic to go to the West Country, there are hundreds of shooting enthusiasts who would rather spend a week’s holiday doing what they love, and bring their families along with them. 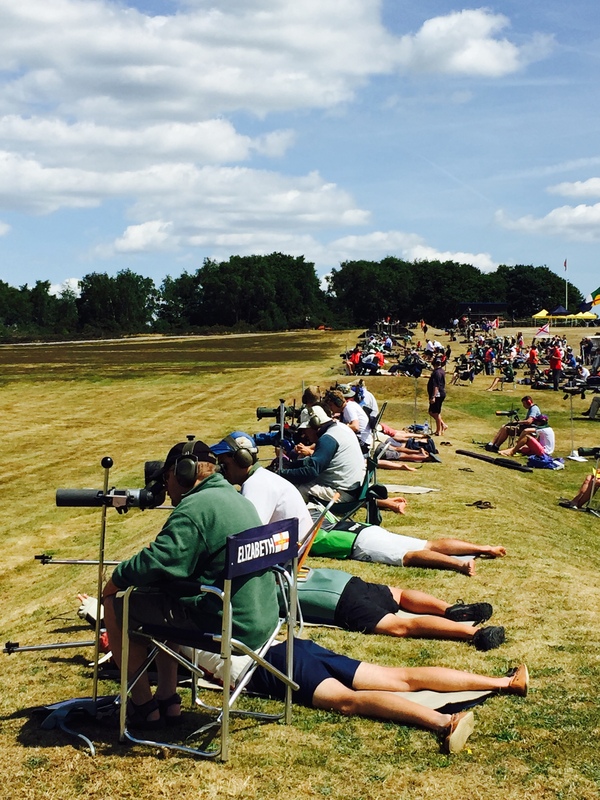 Bisley’s managing director Jeremy Staples says children are happy to spend their time gambolling in the sunshine at the site, seemingly unperturbed by the nearby sound of gunfire. The chalets and lodges dotted around the place have a look of the Empire. They resemble the kind of buildings where you might imagine splendid chaps gathering on the verandah for a sundowner in the beating heat of Rhodesia, rather than in the dappled sunshine of the home counties. There are old red telephone boxes and old-fashioned gun shops preserved as if in aspic. Shooting has been going on here since the 19th Century, and many of the buildings were moved from the last Mecca of British shooting, at Wimbledon Common, in the 1890s. Everything harks back to a different era. 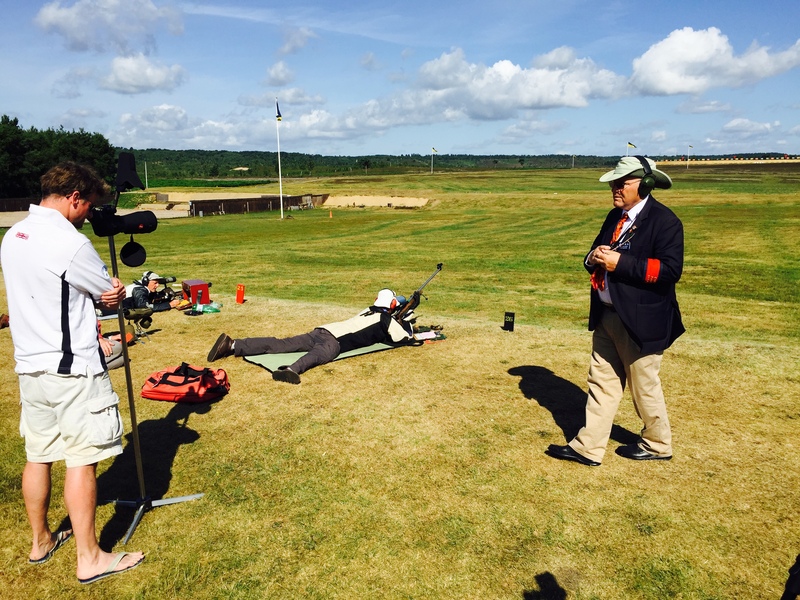 Peter Noss is typical of the “holidaymakers” at Bisley. He has travelled from Cologne to indulge his passion. Nicholas Batai, a member of the Kenyan Navy, has come further: from his home in the Rift Valley, for the fourth year, to enjoy the “atmosphere of friendship”. One thing that has not been frozen in time is the rifles themselves. They relate to an ordinary rifle in the same way a competition bow would to one of Robin Hood’s armoury. They are strange looking contraptions of metal, wood and synthetic materials. The mind boggles at the thought of hitting a bullseye on a target that is 900 yards, more than half a mile, away. But there’s no room for doubt in the minds of competitors, who even seem immune to the heatwave, wearing tight-fitting shooting jackets, resembling the top half of motorcycle leathers. The jackets help hold them steady and allow them to distribute their weight properly. They lie prone, brows furrowed with concentration. A slight changeable breeze can be their undoing. Colin Cheshire is a former captain of the Great Britain shooting team, and a secretary of the NRA. He has been coming to Bisley for 49 years, continuing even since his retirement and relocation to Cyprus. Private schools have a big input into shooting, but Mr Cheshire emphasises the classlessness of Bisley. “You can have everyone from a peer of the realm to a local butcher,” he says. Shooters are also desperate to dispel the idea this is an inherently male pursuit, and there are plenty of female competitors walking around the site, although anyone passing the stall advertising “Big Boys Toys” might think otherwise. Compared with other sports, shooting has a complex image, seen through strange prisms. 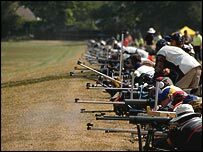 The tightening of gun control laws after the Dunblane massacre carried out by Thomas Hamilton, a gun club member, has affected perception of the sport. And the British perception of America’s gun culture also inevitably bleeds over. Yet this is a sport that involves real guns and real ammunition. The 7.62 x 51mm Nato-style rounds used in competition look similar to the untrained eye to those used in combat rifles like the AK-47 (7.62 x 39mm rounds). For those people who do not care to find out more about the sport, the shooting aficionados on their unusual holiday in Surrey could be dismissed as “gun nuts”. And Bisley is after all the base of the National Rifle Association. Its US counterpart conjures up images of Charlton Heston inviting the authorities to take his rifle out of his cold, dead hand. Bisley’s faithful seem a lot less ardent. Remove the futuristic rifles and the participants appear utterly ordinary. These shooters could be viewed as part of a Great British tradition: that of the enthusiast. Whether it is collecting Elvis memorabilia, deep sea angling, trainspotting, or going to VW Beetle rallies, Britain is a nation that wears its hobbies on its sleeves. For all the noise, this is a sport about stillness, and concentration, and discipline, and not getting demoralised when bullets whizz into the giant sand bank behind the targets. The officials stress safety is paramount. Bullets are handed out by a soldier. One shop advertises the faintly worrying promise of “free eye tests”. Ear protection is mandatory. But it was not always like this. Long-term shooters deafened by gunfire used to be a common sight. Phil Rowell has come from Powys for the week and at 83, is believed to be the oldest person taking part. His hearing is fine, but he remembers that decades ago “only cissies wore ear protectors”. And in a fortnight’s time, Bisley will be deafened by the roar of a different kind as 2,000 Harley Davidson owners arrive for a festival. 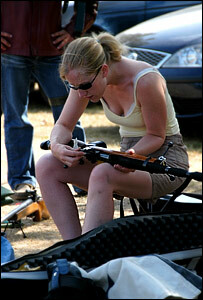 Kindred spirits to the shooters, another group of enthusiasts, enjoying an unusual sort of holiday. 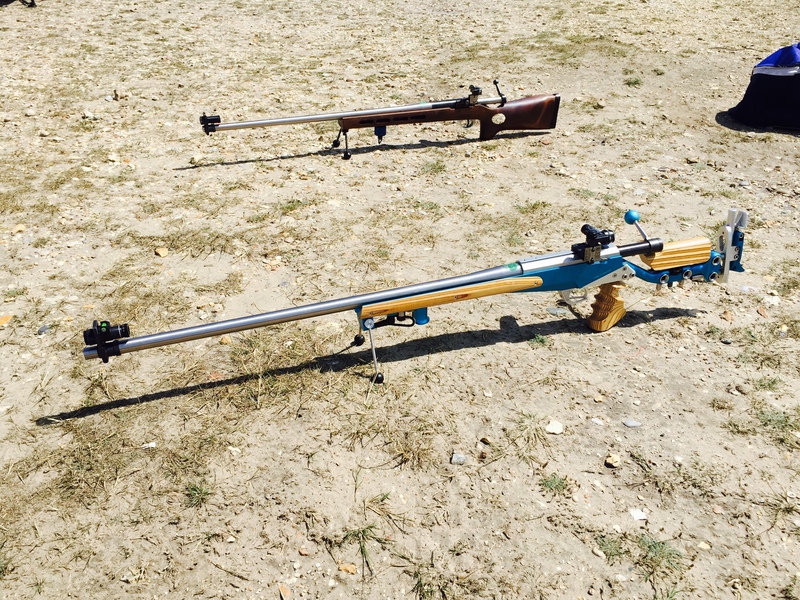 This entry was posted in Reblogged, Spotlight and tagged Bisley, Imperial, NRA, Rifle, shooting. Bookmark the permalink. 1 Response to How competitive are you? Bisley will find you out…. Pingback: Goodguy Nation is in the UK!